It’s expected to dip into the single digits in icy Washington, DC this weekend, thanks to a “polar vortex” that not only describes our weather but also the atmosphere up and down Pennsylvania Avenue, as the White House and Congress continue their standoff. We’re thankful to be getting on airplanes next week headed toward warmer climes, and even more grateful for the (unpaid) public servants that will keep our journeys safe. Meanwhile, a good weekend to stay inside and watch what promises to be a terrific college hoops matchup, and an early preview of the Big Dance. Late last week, Politico reported that the Trump administration is considering using waiver authority granted by a provision of the Affordable Care Act (ACA) to allow states to receive Federal “block grants” for Medicaid, a key component of the 2017 Republican healthcare legislation that was ultimately rejected by the Senate. The move would mark a significant expansion of the Trump team’s ongoing effort to use its regulatory authority to advance conservative policy objectives in healthcare. The administration has already moved forward with “1115 waivers” to allow the implementation of work requirements for Medicaid coverage, although that strategy is being challenged in the courts. The new, more aggressive approach currently being evaluated by the Centers for Medicare & Medicaid Services (CMS) would place spending caps on state Medicaid programs in exchange for flexibility in program design and implementation. CMS Administrator Seema Verma is reportedly a strong advocate of such an approach, which has been a long-standing aim of Republican health policy advocates but has encountered pushback from agency lawyers over the degree of latitude the administration has to make such changes in the absence of legislation from Congress. News of the planned effort brought swift condemnation from Democrats in Congress, as well as from many of the industry and consumer lobbying organizations who were strongly opposed to the failed 2017 legislation to move Medicaid to a system of block grants. Modern Healthcare reported that lobbyists from the American Hospital Association and the Federation of American Hospitals expressed their strong objection to the maneuver. The chairman of the House Energy and Commerce Committee, Rep. Frank Pallone (D-NJ), bluntly stated that the Trump administration lacks the legal authority to implement block granting, according to reporting by The Hill. Other legal analysts agreed; for example, University of Michigan law professor Nick Bagley told reporters that “The administration would certainly face lawsuits and might run into the same sorts of legal problems that it’s encountered in approving work requirements.” Should CMS pursue the strategy, it’s sure to encounter tough questions from Democrats in Congress, who are eager to exercise their newly-gained oversight authority over the Trump administration. We’d expect this story to repeat itself many times over the coming two years, as the Trump team tests out the boundaries of what it can do to reshape the healthcare industry by fiat and regulation, while keeping clear of the courts and Congressional scrutiny. A contracting dispute flared up this week between retailer Walmart and pharmacy benefits manager CVS Caremark, as Walmart sent a letter of termination to CVS stating that it would no longer fill prescriptions for patients covered by CVS’s drug plans. Walmart runs one of the largest retail pharmacy operations in the country and was dissatisfied with the amount CVS was willing to pay it to serve CVS Caremark customers. By the end of the week, the two sides reached an agreement that will maintain access to Walmart pharmacies for CVS Caremark enrollees for multiple years. While CVS’s position was that Walmart had asked for higher reimbursement from CVS Caremark to serve its enrollees, sources inside Walmart told the Wall Street Journal that the retailer was trying to keep rates steady, resisting a cut in payments by the drug plan. The termination would have impacted consumers whose employers provide drug coverage through CVS Caremark, as well as Medicaid recipients enrolled in CVS Caremark plans. Participants in CVS’s Medicare Part D plans would not have been affected, nor would customers who get their prescriptions filled at Sam’s Club rather than at pharmacies in Walmart’s main stores. The dispute highlights the often-murky financial transactions between retail pharmacies and the drug plans that pay for the medications they dispense. In 2012 a similar dispute between benefits manager Express Scripts and retail pharmacy chain Walgreens dragged on for months before being settled, forcing thousands of patients to change pharmacies. Given the broad footprint of Walmart stores, many of which provide the only pharmacy services in rural areas, this latest battle could have proven very disruptive for consumers across the country. Meanwhile, as we’ve discussed before, Walmart has its own drug plan, and is poised to play an even more expansive role in healthcare care coverage and delivery. While the dust has settled for now, we’d expect to see similar issues arise in the future, as large retailers, insurers, and health systems continue to pursue vertical strategies that allow them to “own” the healthcare consumer. 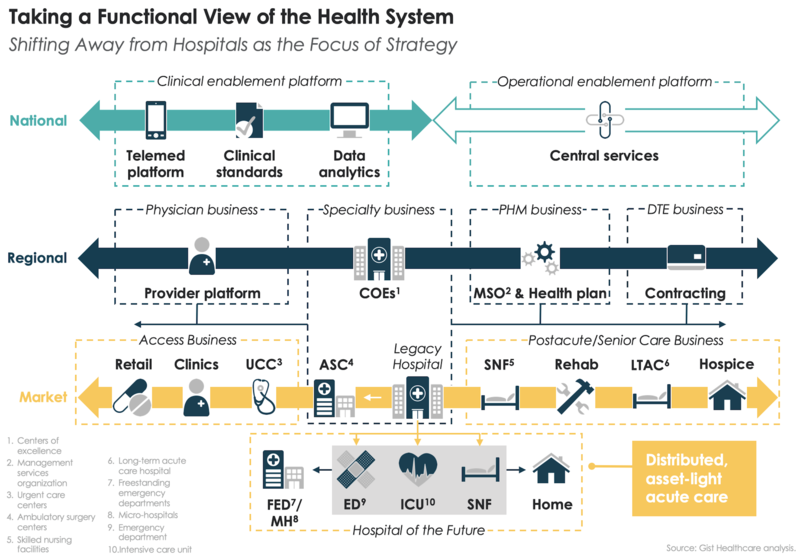 There will be more border skirmishes between these competing entities, whose “value-creating” vision entails building fully-integrated healthcare platforms to provide end-to-end services to consumers. How “closed” those platforms are, and how aggressively the vertically-integrated companies defend their perimeters, will bear careful attention—especially for those citizens who find themselves living near the borders. Sign up for Medicare, get an Apple Watch? It was reported this week that Apple is in talks with three unidentified Medicare Advantage (MA) insurers to provide discounted Apple Watches to at-risk seniors enrolled in the plans. Apple already has partnerships with UnitedHealthcare and Aetna to subsidize the cost of the device for plan members who walk at least 10,000 steps per day, and it has a deal with life insurance provider John Hancock to provide discounted Apple Watches to customers that meet healthy-lifestyle goals. The growing MA market is particularly alluring for Apple, and the company has targeted some of the new capabilities of its wearable device—including fall detection and heart monitoring—directly toward seniors. Apple CEO Tim Cook recently told CNBC host Jim Cramer that the company was planning to announce even more health-related services soon, saying that “Apple’s most important contribution to mankind” will be in the area of healthcare. As it faces slowing revenue from its flagship iPhone products, Apple clearly views the lucrative, device-savvy Baby Boomer market as an attractive target for its $400+ Apple Watch and is making a cost-avoidance argument to insurers to gain their cooperation as a sales channel. “Avoiding one emergency room visit would more than pay for the device,” Bob Sheehy, CEO of insurer Bright Health and former UnitedHealthcare CEO told CNBC this week. There is reason to be somewhat skeptical of the actual health benefit provided by Apple Watches and other “wearables”, at least to date. Attempts to use Fitbits to monitor step count and physical activity as part of a broader care management strategy have been challenged by the rapid “time-to-drawer” phenomenon exhibited by many Fitbit owners, as well as ongoing concerns about privacy and the use of personal health data by insurers and employers. Whether Apple Watch wearers will be as quick to abandon their devices remains to be seen, especially for consumers who “earn” their watches through enrollment in an insurance plan rather than paying for the device themselves. Doctors have also expressed concerns about false positives and overdiagnosis as a result of widespread use of the Apple Watches for monitoring heart activity. That said, as a perk for enrollees, providing a free or discounted Apple Watch seems like a no-brainer for an MA plan that stands to earn tens of thousands of dollars in premium payments for each new customer, and a smart way for Apple to drive penetration of its watches in the Baby Boomer population. Not that he asked, but one piece of healthcare advice we’d tell Tim Cook to ignore completely? The suggestion from CNBC’s Cramer this week that Apple buy EHR vendor Epic Systems. Dumb! 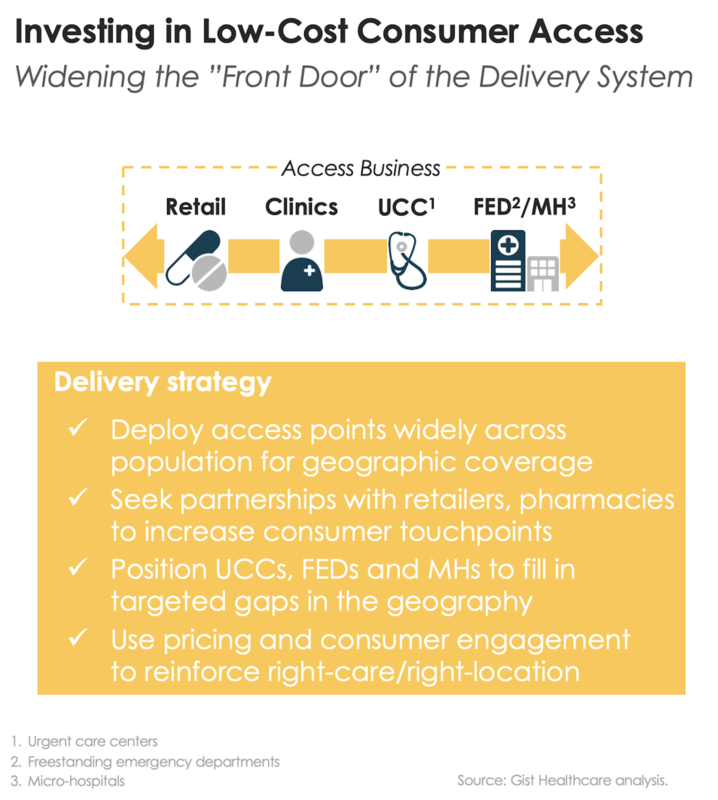 Over the past several weeks we’ve been sharing our framework for helping health systems create a new approach for investing in delivery assets, with a consumer-oriented approach to planning. This starts by asking what consumers need and working backward to what services, programs and facilities are required to meet those needs, which led us to break the enterprise into component parts that perform different “jobs” for the people they serve. We think of each of those parts as a “business”, located at either the market, regional or national level depending on where the best returns to scale are found (and on the geographic scale of any particular system). 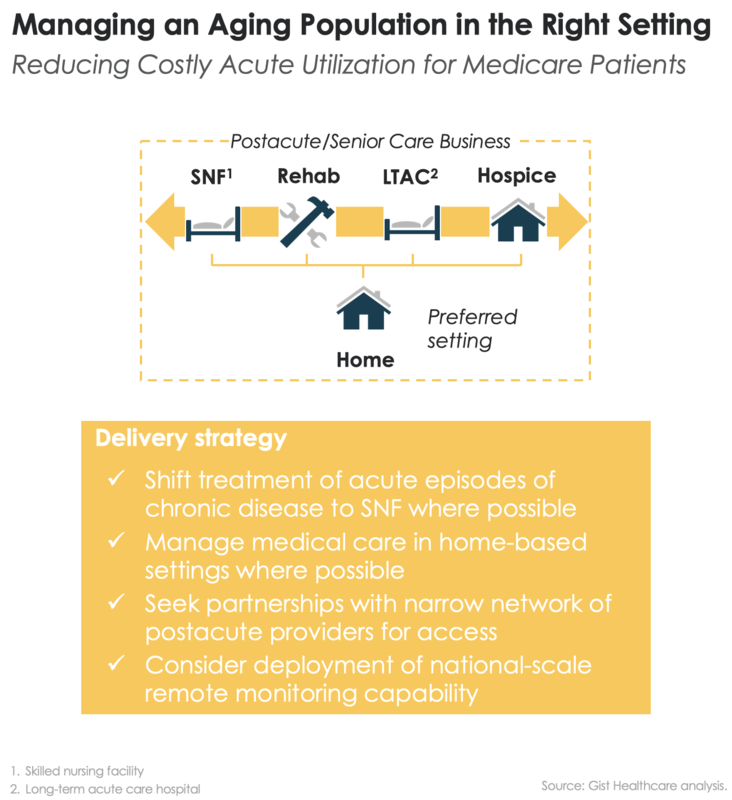 We began by describing how a consumer-oriented health system should be organized at the market level, with expanded access and senior-care businesses providing lower-cost care in an outpatient setting for many services that were previously delivered in an acute-care hospital, and how the profile of the local hospital needs to change in response. And last week we began laying out the health system services that can be scaled at the regional level, starting with specialty care, the medical and surgical specialty services that comprise much of hospital service lines. Today we look at how this framework can be applied to the health system’s “physician business”, the owned and aligned medical groups and physician practices that are responsible for delivering care, as shown below. (A better term may be “provider network”, as the enterprise includes not only physicians but also other providers, in particular advanced practice providers, who directly manage patient care.) The size of the “aligned” health system provider network has grown, both as the number of employed physicians has risen and systems have grown through mergers and acquisitions. Health systems are still in the early days of determining how best to find value from scale in the physician network. We’ve seen some very large health systems attempt broad standardization across a national physician network—unifying brand, operations, compensation and management across markets and regions—only to back away from mass centralization and devolve many of these functions back to local physician organizations. While the focus of any individual provider or medical group practice will remain local, centered on the immediate patients and community they serve, these early attempts have shown that key elements of the physician enterprise are best organized at a regional level. 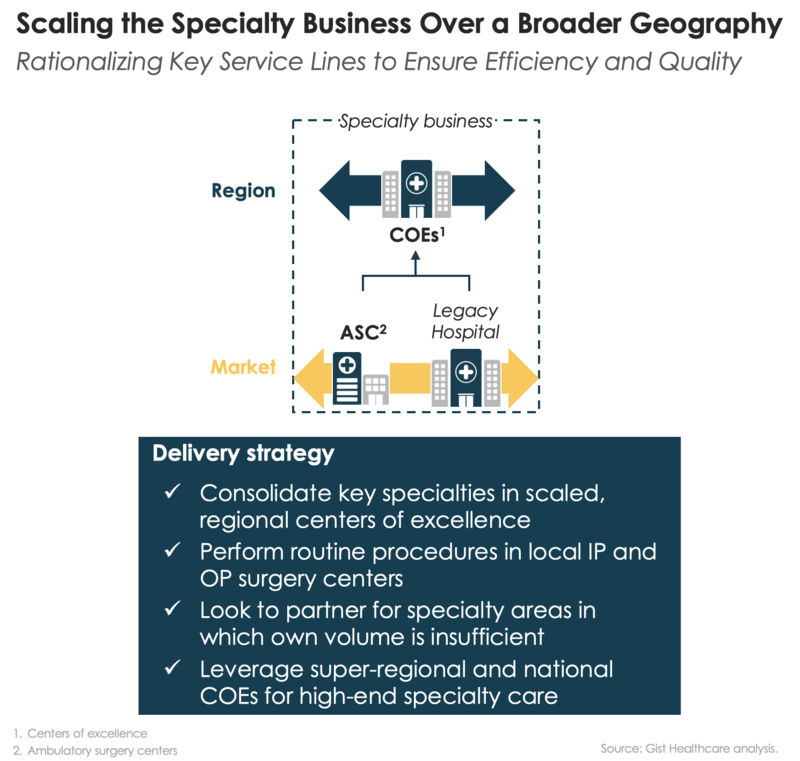 Governance and management of providers in a unified regional organization enables the creation of a consistent market access and delivery strategy which allows capacity to be maximized across a region for both primary care and specialty care, and facilitates centralization of resource-intensive, high-end specialty care services. 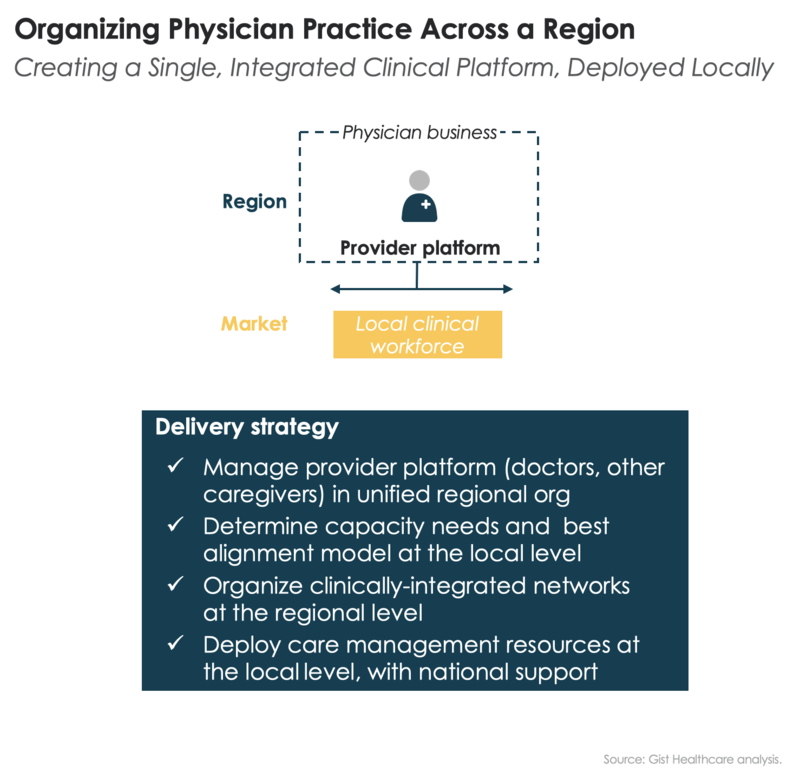 Clinically-integrated networks, which align independent and employed physicians and other providers under a common care delivery and contracting platform, allow for regional coordination of care management resources that are deployed locally. Moreover, development of a common platform for contracting and branding at the regional level streamlines interactions with payers and employers and allows for the creation of unified network products (for example narrower “high-performance” networks, which may include access and cost guarantees) to be sold to purchasers. Toward this goal, the regional provider network must work in lock-step with the system’s population health and contracting businesses, which we will discuss next week. Recently I had the chance to present a guest lecture on the future of the healthcare marketplace and implications for physician practice to medical students at one of our academic health system clients. I shared our perspective on the major drivers of healthcare cost growth, the political dynamics of healthcare reform, the impact of shifting demographics on health system economics, and the need for providers to align around consumer value. The students, as you’d expect of high-performing doctors in training, quickly grasped the larger dynamics shaping the industry but craved more detail about how the “business” of healthcare works: Who pays for what? Who decides how much a hospital or doctor gets paid for delivering care? If a patient doesn’t have insurance, do they still get a bill—and what happens to them if they can’t pay it? Is it true that most doctors are employed by a health system? And what exactly is a “health system”? Talking with these medical students reminded me how little I learned in the course of my medical training about any of these issues. Somewhere in the “basic science” years, I recall a few lectures that touched on rudimentary health care spending dynamics (the US spends more on medical care than any other country, this spending is going to rise even faster given aging and growing incidence of chronic disease, etc.—slides that could be repurposed for a similar lecture today). Sure, I knew Medicare paid for care for the elderly and Medicaid covered the bill for some of our disadvantaged patients, but it wasn’t until residency that I remember learning anything about the specifics of healthcare billing and payment. I am indebted to the interim department chair who devoted a handful of lectures to explaining how the department’s radiologists got paid. Before that session most of my fellow residents and I didn’t know a DRG from a CPT code, and had no idea what it meant to bill for professional and technical fees, much less how that might relate to a medical group’s income or a doctor’s salary. My recent session reminded me of the need for more integration of the “non-clinical” elements of healthcare and physician practice into the curriculum. If this class was any indication, today’s medical students are more attuned to the political and business dynamics affecting their chosen profession than my peers and I were nearly two decades ago. This generation of young doctors has a strong desire to be politically active and asked how they could mobilize for change on behalf of their patients. Furthermore, understanding the larger forces shaping healthcare can influence choice of specialty—particularly for students considering primary care. If we want to increase the number of primary care physicians (PCPs), students need to know about the expanded role PCPs and their teams are playing, early enough in training to inflect choice of residency. And students want to know how to deliver care that is lower-cost and team-based but worry that they’re not learning the necessary skills. Clinical training must teach doctors how to manage a team, discuss cost trade-offs with patients, and understand the application of care standards. Failing to integrate these skills into med school curricula will perpetuate a generational lag between the doctors who are entering practice today and the physician workforce we need in the future. Recently I spent the day with the executive team of a well-known academic medical center (AMC) in the Midwest. While they have nation-leading programs in a handful of key areas, they’d best be described as a regional player—with a strong brand in their geography, an impressive downtown campus, and a highly-regarded training program. Across the course of the day, we discussed several of the challenges they, along with many of their academic peers, are facing. In an era of constrained pricing and greater transparency, they struggle with being viewed as high cost relative to their regional competitors. And given the changing reimbursement environment, they worry about the sustainability of funding for their research and teaching missions. 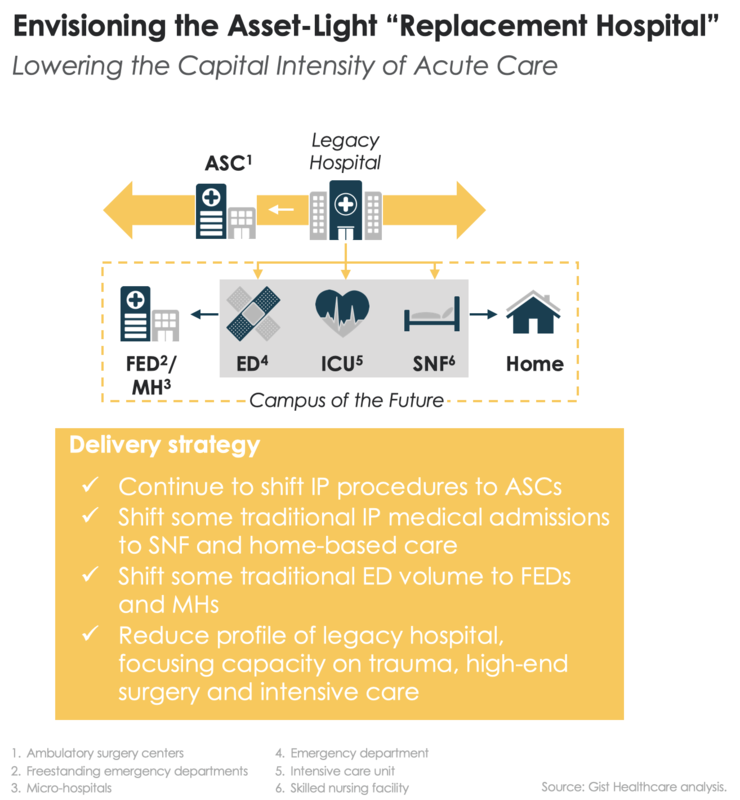 They, like many of their peers, have felt the need to assemble a community hospital system that allows them to decant lower-acuity care from the main academic center, while leveraging this referral network to feed their specialty programs. Integrating community-based physicians with the faculty practice has proven to be a challenge, as it often is. While every organization is different, many of these issues are common across the AMC landscape—it’s an increasingly difficult sector of healthcare. One of the concerns executives raised in our meeting was their sense that their surrounding regional health system competitors—two large, community-based nonprofit systems and a for-profit chain—are aggressively trying to encroach on their “academic” terrain. By recruiting marquee-level clinical talent in key service lines, investing in leading-edge clinical technologies (proton beam therapy, genomics programs), and branding heavily around high-tech care, their competitors have stolen a march on them by positioning themselves as credible alternatives for high-end care. At the same time, the community health systems have steadily invested in access points, physician practices, and outreach. All of this has left the AMC executives feeling a bit “surrounded” in their academic fortress and questioning how long they’ll remain “must-have” in payer networks. This is a concern that I’m increasingly hearing from leaders in the academic community: we’re expected to invest in research and advancing knowledge, train the next generation of clinicians, and at the same time we have to compete for clinical care delivery with community-based systems that aren’t weighed down by those “extra” commitments. No easy answers—it’s a tough equation to solve. Of course, given the deep pockets of many academics, it’s hard to feel too sorry for them, but it’s definitely worth watching how AMCs balance the competing demands of affordability and excellence. Available wherever quality podcasts are found. If you’ve made a new year’s resolution to listen to something a little more…edifying during your daily commute, here’s a tip: invite Melvyn Bragg to come along for the ride. Bragg is a legend of broadcasting, having created and hosted one of the most successful arts and culture shows ever to air on British TV—The South Bank Show, which ran every week for 30 years. For the past 20 years, Bragg has also hosted a show on BBC4 (sort of the UK’s equivalent of NPR) called In Our Time, a 45-minute panel discussion program that covers a wide array of topics from history, literature, the arts, science, philosophy, and culture. For each episode, Bragg assembles a group of three specialists (typically from academia) and moderates a discussion that serves as kind of a mini-seminar for listeners. His style is that of an Oxford don—probing, Socratic questioning that leads the expert panelists along a path that “unfolds” the topic, giving his audience a guided tour of often esoteric, but always fascinating subjects. A representative list of topics pulled from the listener-voted “Top 10” of the past 20 years: “1816: The Year Without a Summer”; “Epic of Gilgamesh”; “The Gin Craze”; “Hildegard of Bingen”; “Photosynthesis”. A new episode is broadcast live on the BBC every week, and the entire archive from the past 20 years is available to download on the BBC website, iTunes, and elsewhere. Even on subjects that initially seem dull or too specialized (“The 12th Century Renaissance”, anyone? ), the show is terrific, and you’ll come away armed with just enough knowledge to impress yourself and your friends. And with hundreds of archived episodes available to download, you’ll be spoiled for choice. So switch off the Top 40 noise and talk radio chatter, and feed your head—the commute will fly by! This week Blue Cross Blue Shield of North Carolina (BCBS-NC) announced the launch of a new value-based care partnership aimed at lowering the total cost of care for enrollees. The first five “Blue Premier” participants include some of the state’s largest health systems: Cone Health (Greensboro), Duke University Health (Durham), UNC Health Care (Raleigh), Wake Forest Baptist Health (Winston-Salem), and WakeMed Health & Hospitals (Raleigh), all of whom joined the program as of January 1st. At a high level, Blue Premier is modeled on the Medicare accountable care organization (ACO) models that BCBS-NC CEO Dr. Patrick Conway and his team developed during his tenure as Director of the Center for Medicare & Medicaid Innovation (CMMI). Participating providers will share in any savings generated and will assume some downside risk for the total cost of care over the multi-year duration of the agreement. Conway has been publicly resolute about shifting all of BCBS-NC’s hospital contracts to total-cost risk, sending a strong message that this path is not optional for hospitals by saying last year: “I will never give you a fee-for-service rate increase if you don’t go on the value-based healthcare journey with us.” This first round of contracts shows that BCBS-NC is doubling down on their aggressive stance on value-based contracts—and that providers are willing to participate. While we applaud Conway’s efforts to move the commercial insurance model toward value, it’s far from a slam-dunk in delivering lower costs.According to BCBS-NC, these five systems provide care for a quarter of all of their customers, and he hopes that 50 percent of BCBS-NC customers will receive care from providers participating in Blue Premier. But it is unclear whether half of all BCBS-NC enrollees will be attributed patients under the risk contracts, given that large segments of the Blue’s business, most critically self-funded employers, may not be included in Blue Premier. And as we’ve discussed previously, translating the Medicare ACO model to the commercial population brings added complexities. Just a few to consider: are savings easily achievable in a healthier population where high-cost events drive much of the spending? How will the plan attribute commercial patients, who are less likely to regularly see a primary care provider? Will savings result from better care management—or from lower rate increases that are purportedly part of the Blue Premier contracts? Conway’s ultimatum of “partner or else” will bring health systems to the table, but will it engender the collaboration and co-creation needed to develop a successful and sustainable model? Providers across the country should keep a close eye on the performance of the Blue Premier program—its success or failure could set path for other Blues plans as they evaluate provider partnerships. Kaiser Permanente (Oakland, CA) announced this week that it will spend $5.2M to acquire an east Oakland apartment building as part of its efforts to improve access to affordable housing and address homelessness. The building, which was put up for sale last year, houses 50 residents and was “on the brink of gentrification”. The investment from Kaiser’s Housing for Health fund will provide $1M in improvements and be a central part of the system’s plans to provide housing to 500 at-need Oakland residents. It’s part of a $200M initiative launched by the system last May to mitigate homelessness in the regions where the system operates, which include markets with some of the the highest levels of housing insecurity in the country. Kaiser’s large investment in a focused area like housing support is one likely to make a measurable impact, and as described by the company’s CEO Bernard Tyson, represents a need to invest not just in healthcare but “healthy communities”. The system has been criticized by other nonprofit providers for its focus on the commercially-insured population, and for delivering very little care to under- and uninsured patients. While Kaiser’s business still remains squarely in the commercial market, it’s not immune from the market forces affecting other providers and will see more of its future growth come from Medicare and Medicaid as the population ages and the percentage of Americans covered by commercial insurance declines. Given the system’s experience in population management, we’d bet with Kaiser to develop a model that effectively manages care for publicly-reimbursed patients—which will require them to continue to expand their investments in these kinds of community-based partnerships to address the social determinants of care. A little “young blood” to pep you up? Run down after the holidays? Already abandoned your New Year’s resolutions? Feeling left behind by your younger colleagues, who just seem to have more bounce in their step? Maybe what you need is to steal their blood! Ambrosia, a Monterey, CA-based start-up may be able to help, announcing this week that they’ve completed a clinical trial to evaluate the effect of transfusing older adults with the blood of younger people, in this case, donors aged 18 to 25 (we guess this means 26 is now the official start of “old”). The company’s consumer website has officially launched, and the service looks to be up and running. Patients can get one or two liters of plasma over two days for the low, low price of $8,000-$12,000. Ambrosia also announced that it has service locations available in five US cities and is accepting PayPal payments for the treatment. The clinical trial was real (or at least real enough to be registered on ClinicalTrials.gov), but the science driving it is shaky at best. Ambrosia based its research on a blood exchange study performed on mice showing some rejuvenating effects in older mice who received the blood of younger mice. Ambrosia’s CEO Jesse Karmazin, who has a medical degree from Stanford but does not hold a license to practice, said he has seen dozens of procedures performed safely and wants to use the technique to fight aging, saying in a Business Insider interview: “Some patients got young blood and others got older blood, and I was able to do some statistics on it, and the results looked really awesome. And I thought, this is the kind of therapy that I’d want to be available to me.” Researchers, including ones who participated in the mouse study, disagree, citing the unproven benefits and very real—and potentially dangerous—side effects of multiple blood transfusions. Ambrosia’s pitch is based on questionable science, but taps into the innate human desire for a “fountain of youth” and will likely find many customers willing to pay thousands of dollars for a likely ineffective therapy. The story points to a troubling side of consumerism in healthcare—the potential for unproven and possibly unsafe therapies to find willing customers among a buying public that may lack the sophistication to discern hype from reality. For now, we’ll stick to Vampire Weekend when we need an infusion of youthful energy. Thanks again for joining us for the Weekly Gist and taking time to read our thoughts. We love hearing from you, so please share your comments and suggestions! And if you’ve found this worthwhile, please forward it to a friend or colleague, and encourage them to subscribe. Most importantly, if there’s anything we can do to be helpful in your work, we hope you’ll let us know. You’re making healthcare better—we want to help!